We recognize that power generation systems, whether gas turbine, nuclear, or coal burning, offer some of the harshest environments imaginable. Therefore all of our power generation filters are designed specifically to withstand the rigors of extreme operation. 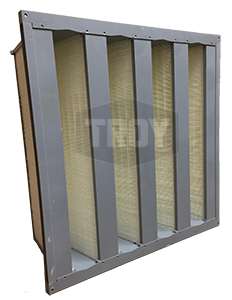 We develop our products using the best materials available, optimizing filters to provide low pressure drop, high efficiency, and extended service life, so that the air used in your systems are as clean as possible. Gas turbine filters, nuclear filters, cartridge filters, panel filters, pre-filters, filter media, washable filters, bag filters, etc... are all constructed to meet the highest standards for performance and stability. View more power generation filter options here, or contact us for more information. Burst pressure > 25" w.g.